Prime Minister Shinzo Abe of Japan (R) greets President Park Geun-Hye of the Republic of Korea as President Barack Obama looks on during a meeting at the Nuclear Security Summit March 31, 2016 in Washington, DC. The United States pledged Thursday to deepen cooperation with allies South Korea and Japan on deterring the North Korean nuclear threat, working to ramp up pressure following worrying provocations. Leaders of the three countries urged the world community to vigilantly enforce new U.N. sanctions. 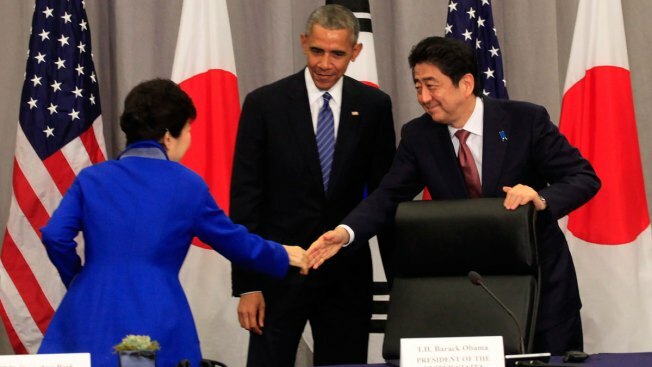 President Barack Obama didn't disclose what further steps the countries might take as he met with Japanese Prime Minister Shinzo Abe and South Korean President Park Geun-hye on the sidelines of a nuclear security summit. But he said the countries had directed their teams to work together to help bring about a denuclearized Korean Peninsula. As a nuclear security summit opened in Washington, the U.S. said a strengthened nuclear security agreement among nations was finally set to take force, including new criminal penalties for smuggling nuclear material. The stricter rules for protecting materials and nuclear facilities worldwide were intended to reduce the likelihood of terrorists getting their hands on ingredients for a bomb. Recent ratification by a critical mass of countries cleared the way for the changes to take effect in about a month. China's influence over North Korea will be front and center later in the day when Obama sits down with President Xi Jinping. The White House said that meeting was also an opportunity for Obama to press U.S. concerns about human rights and China's assertive territorial claims in waters far off its coast. Hanging over the meeting were ongoing discussions about the Terminal High-Altitude Area Defense system, or THAAD, although the U.S. said it didn't specifically come up. The U.S. and South Korea are weighing deploying the U.S. missile defense system in South Korea to counter the threat from the North. China has resisted that step out of concern it would also give the U.S. radar coverage over Chinese territory, and Russia opposes it as well. For Obama, the summit's offers a last major chance to focus global attention on disparate nuclear security threats before the president's term ends early next year.